Little Ricardo was born in Hosptial Cayetano Herdia in Lima, Peru with a complete bilateral cleft lip and palate. His parents received little guidance, so they sought out feeding information at KusiRostros. His parents followed all the instructions and they attended weekly check-ups. After 3 months, Ricardo reached a healthy weight. 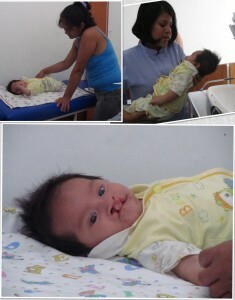 His mother began working at night because Ricardo’s father had an accident and his leg was in a cast. Ricardo’s mother takes care of Ricardo during the day and has learned to extract breast milk so that Ricardo’s father can feed him while she is at work. Ricardo’s parents have stated that they are very grateful for the support they have received. Ricardo will undergo several surgeries as well as genetic testing in the near future, as Ricardo may have Goldenhar Syndrome.